Ethel Sarah Macgregor was born on the 4th October 1876 in Annfield House, Kirn, Dunoon, Argyle, Scotland. She was the eldest daughter of John Macgregor (the second son of John Macgregor of Finnart and Margaret Fleming) and Sarah Jane Hicks. Sarah Jane died on the 18th September 1880 at the family home in Dunoon and in 1881 Ethel was living at 4 Jews Walk, Upper Sydenham, Lewisham, with her father, her four youngest siblings and four servants. The children moved to Bristol after their father died on the 18th of March 1882. It is probable that they lived with the family of their mother, who came from there. 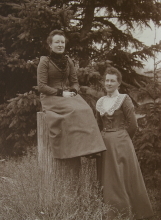 Ethel emigrated to Canada in 1890, with her sister Amy and possibly her brothers James and Edwin. In the 1901 census she was at 141 Spence Street, Winnipeg with her sister Amy. She was not married at that time and working as a photographer, for which her annual income was listed as $200. 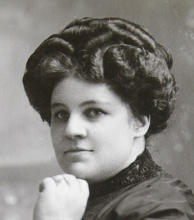 Soon after this she married Frank Blakely, who was born 1865 in Ontario. At the 1906 census, they were found at 285 Ellen Street, Winnipeg, with Frank's mother Ellen, born in Ontario in 1849. Helen Jane (Jean) Blakely, born on Dec 4th 1907. 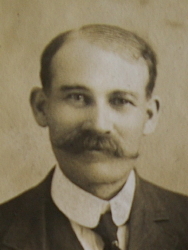 Frank Blakely died on 30th of March 1918 at 252 Maplewood Avenue, Winnipeg, leaving Ethel and Jean. They moved to an apartment in Assinaboine Avenue, Winnipeg. When Jean married James Oliver, on June 13th 1942, Ethel then went to live with her sister Amy. Jim and Jean Oliver lived on Assinaboine Avenue until they moved to Cornwall, Ontario in 1946. Ethel moved with them to Cornwall and lived with them from then until she moved to a nursing home about 5 years before she died. In 1949 the family moved to 214 Edward Laurin Boulevard, St. Laurent, Montreal, and later 11360 O'Brien Boulevard, Montreal, P.Q. Ethel died Feb 20th 1967 in a nursing home in St Laurent. Ethel's cremation took place at Mount Royal Cemetery, Montreal but she was buried at St. John's Cathedral Cemetery in Winnipeg.